Haha that is a great story! I just love that a mishap turned into such a glorious recipe! This flatbread looks so fluffy and perfect… Annnd now I really want that tomato, mozzarella, and basil sandwich in flatbread… YUM! These flatbreads look amazing! I can just imagine how delicious they are when they’re fresh and all warm and fluffy. I’m always looking for more reasons to consume hummus so this might be the reason – I *need* to try and make my own flatbread and then I’ll *need* hummus to consume the flatbread with! Thanks for the recipe! Hi, Carmy! I love your logic!!!! Ha! Oh my gosh your story reminds me of a story Alton Brown told on one of his live show tours a few years ago when he talked about how he worked at a bakery and threw out some dough in a dumpster… and then watched in horror as the dough literally filled the dumpster and started overflowing! I totally have a bread weakness. I can pass up chocolate, ice cream, candy, noooo problem. But bread? That’s truly the food I cannot live without! 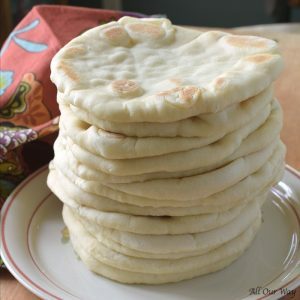 This flat bread sounds amazing and I can just feel how soft it is by looking at your pictures! I love the story about a possible disaster turning into one of your favorite recipes. Yay for not giving up. I love flatbread, definitely going to save this. I bet the pizza was fantastic. I never thought to do that with flatbread, genius! Yes, we’ve all had those experiences where we misread or misunderstood a recipe and have had to make adjustments on the fly. Sometimes they work and sometimes… you order pizza. This flatbread looks absolutely perfect — and whether you pair it with baba ganoush, hummus or tuck in your favorite sandwich fixings, it’s a winner. I can never find good flatbread at the store, so this is perfect! We love gyros, but I usually end up using naan to wrap it instead of flatbread. Maybe I’ll be adventurous and try baking bread this weekend! I always prefer homemade bread and this looks so good!Perfect, soft,and delicious to go with any curry.wonderful recipe. I love this recipe. We almost never buy bread and instead make it. I am the baker, so I made this today. On thing I messed up was stacking the uncooked flats in a pile… nope… first 8 were fine then they all stuck together! I cut the stack into pieces, rerolled and cooked. All was fine. Lesson learned. I have the idea of adding some herbs de Provence to the dough next time for a little different flavor, maybe a couple of teaspoons to start and see how it works. Hi, Lance! Ooops!! At least all came out well.😅 We’ve had some goof-ups too. Our kids and grandsons love the recipe! It’s so easy to do and the result is worthwhile. Thank you so much for commenting – we love hearing from you. And we’ve added Italian seasoning to our flatbread so I believe the herbs de Provence would be excellent. Have a great weekend. I have made this recipe several times now. 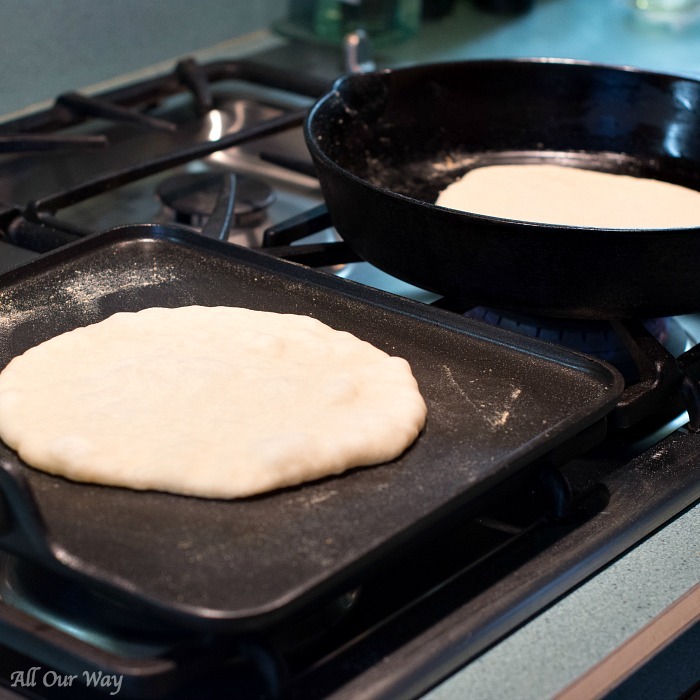 We use it to make naan…my husband is from India and he says this is the BEST naan he has ever had! This is also a very easy recipe! I have substituted buttermilk for milk–to get that tangy taste. Next time I am going to try yogurt and see what happens. I agree that perhaps you have to add some water or milk to thin the yogurt. My guess would be to use 1/4 c of yogurt and 1/4 c milk. Perhaps a bit less flour. Hi, Karen!! It’s such an easy recipe, isn’t it? Also very versatile!! Thank you for the tip on your version. I think you can experiment and still get great results. Our grandsons love this recipe — for them, it’s a great snack after school. Hi, Cathy! You might look at my answer to Joel. I address the issue. I haven’t heard back from him but I do believe it is possible, you just have to make adjustments. Hi, Jolina!! They are so easy you’ll want to make them all the time. I LOVE this flatbread. It’s softer and easier on my aging dentition than pizza dough, it stays soft after it cools, unlike naan, which gets stiff and crunchy, and there’s no bigas or poolishes or 4 hours of rising and proofing. I do miss the tang of yogurt in naan though. What do you think; could I sub an equal amount of yogurt (by weight) for the milk, or a portion of it? 6 cups of flour? i made a flatbread with almost the same recipe like yours while ago, but it use 3 cups of flour. but yours look so fluffy and soft, might wanna give it a try. Hi, Kate! It certainy is good. Our entire family loves snacking on it. Thank you, Prasanna! It does resemble Naan. I’ve made that before too but never posted the recipe. We really like our bread. I have never made my own flatbread. Not sure why not, since I love making bread. I make corn tortillas, and yet I have not made regular tortillas. 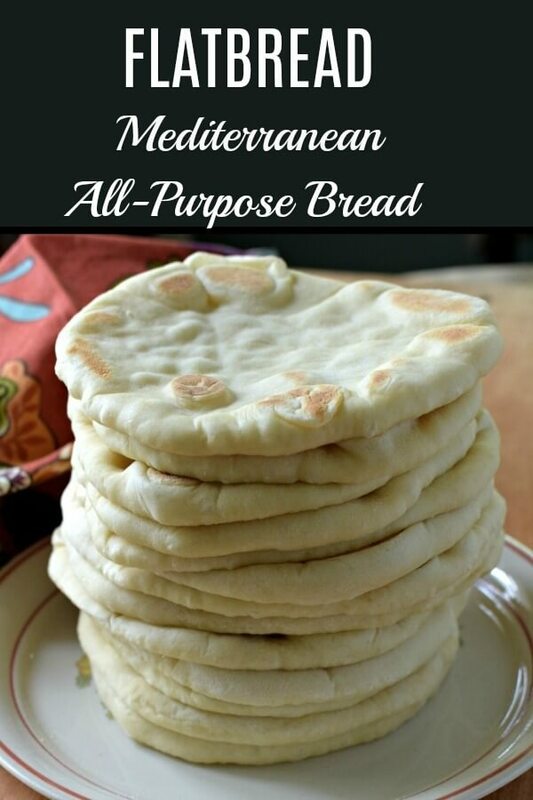 I need to give this recipe a try since I am ALWAYS buying flatbread at the grocery store…and you know for sure homemade is always better. Hi, Gloria! Once you make it you’ll keep making more. It’s become a regular chore and we love doing it. These look amazing and I would love to try them. Flatbread is one of my favorites despite the fact that they go straight to my waistline! I love bread, and flat breads a favorite for all sorts of things. I’ll have to half the recipe for me and mine, but I can’t wait to give it a try. It looks absolutely delicious, and sometimes the best things come from mistakes, don’t they? Hello, Kathy! We do love our bread and this recipe is easily halved. But it really freezes well, you might think about making it all and freezing. We use plastic wrap on individual rounds and then put them in a freezer bag. It’s easy to thaw and warm one up. Our kids and grandkids use them for a snack and/or sandwich wrap. 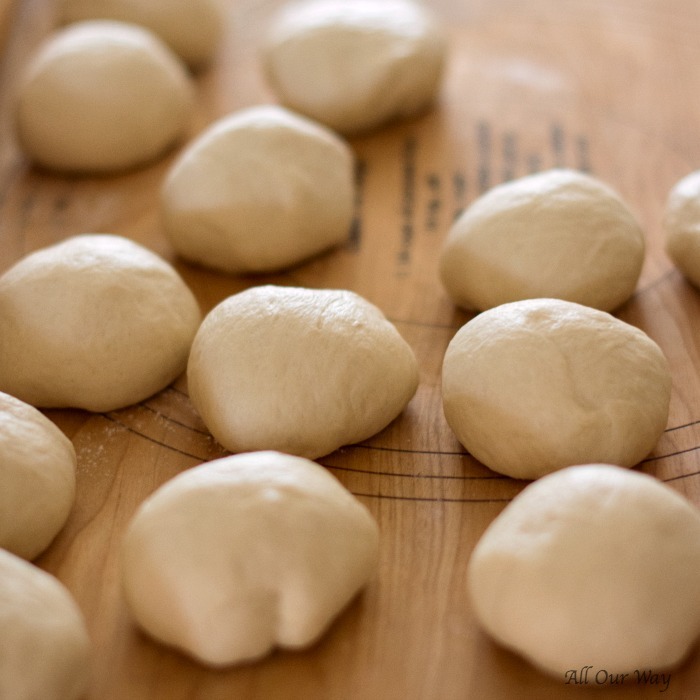 Just wanted to let you know I made a batch of the flat bread dough a week ago, intending to divide it and freeze, to have on hand for our traditional “Sunday night pizza.” I started the dough before leaving for a soccer game on Saturday afternoon. I knew I wouldn’t be back for several hours, so put it the coolest room of the house to rise slowly. Then I invited daughter & son-in-law, the 15 year old soccer player, and my occasional son for Saturday night pizza. Used more than half the dough & everyone loved the pizza. I gave my daughter the rest of the dough & the recipe printout & encouraged her to try the flatbread. A few days ago I made another batch. Divided it into little balls for future pizzas & saved out enough to make four flatbreads. OMG!!!! We had it fresh and warm along with supper and it was sooooo good. I could have eaten just that for supper! Used it for pizza again on Sunday night & it was wonderful again. And now we are pulling off pieces of the remaining flatbread just to munch on now and then. later this week I’ll try the Baba Ganoush & make more flatbread. I checked with my daughter a few days ago and she had used the dough to make flatbreads & then a little gourmet pizza. You have introduced a new addiction to at least two more households! Thanks for the yummy! Hi, Marcia! I’m so glad you like the recipe!! It sounds like you’ll have an old standard to go back to. There is nothing like hot bread do go along with a meal. Thank you so much for letting me know what you think, I really appreciate. Sending you super big hugs!!! ? Love this recipe! We gave it a try and it turned out wonderfully well, thank you! Hello, Anna! Thank you so much for taking the time to comment. I’m glad you like the recipe. Wish I could send you some, Sasha! Love that the bread came together despite all the adjustments! Cooking can be really hit or miss for me sometimes, especially when yeast is involved but I def want to give this a try ? Also, baba ghanough is AMAZING ? Hello, Giselle! Sometimes mistakes can become a greater recipe than the original — this was one of them. Yes! You’ve got to try the baba ghanoush with the flatbread. Wow, That looks like store bought! Perfection! I love reading the story behind this recipe! And the flatbread seriously looks great, I’d love some right now. Hi, Kelly! I’d love to send you some, except our kids, got the rest. This looks so delicious! I’m going to try making this soon. Hi, Anne! My daughter-in-law says she has it for breakfast.We don’t have any left to try — the family took it all. Oh, Soniya! I wish I could. Our kids wiped us out of all of the flatbread. We are going to be a flatbread making machine. That looks like some amazing flatbread! Delicious! I’m such a bread fiend! Thank you, Amy! You aren’t the only bread fiend. ? My husband is a big fan of flatbread. This would be well received here because it sounds like it’s versatile enough to be used for a number of different things. Hello, Val! We now see why flatbread is so popular. 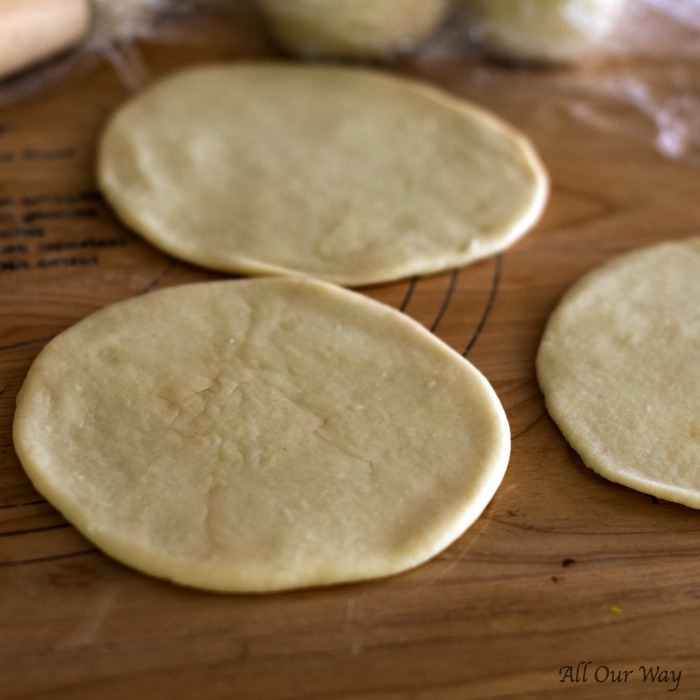 We’ve made pitas for years but flatbread has a different texture that we like. Once I have made homemade bread. there was no turning back because it’s so much better than store-bought and I can imagine the same for this delicious flatbread! I think it’s the smell of baking bread that increases the anticipation and appetite!! Your flatbread is perfect and beautiful. 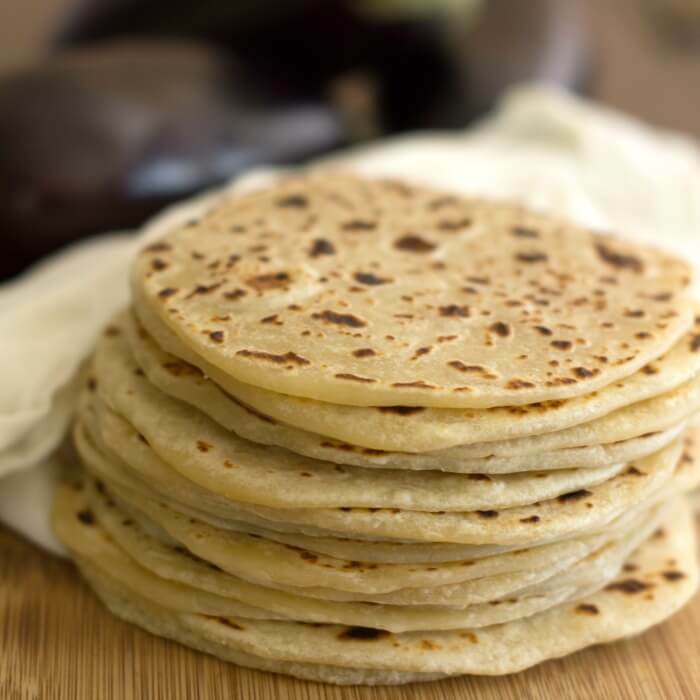 I make Indian flatbread every day, making yeast flat bread is always tricky you perfected the recipe, I am going to give it a try. Thank you, Swathi! 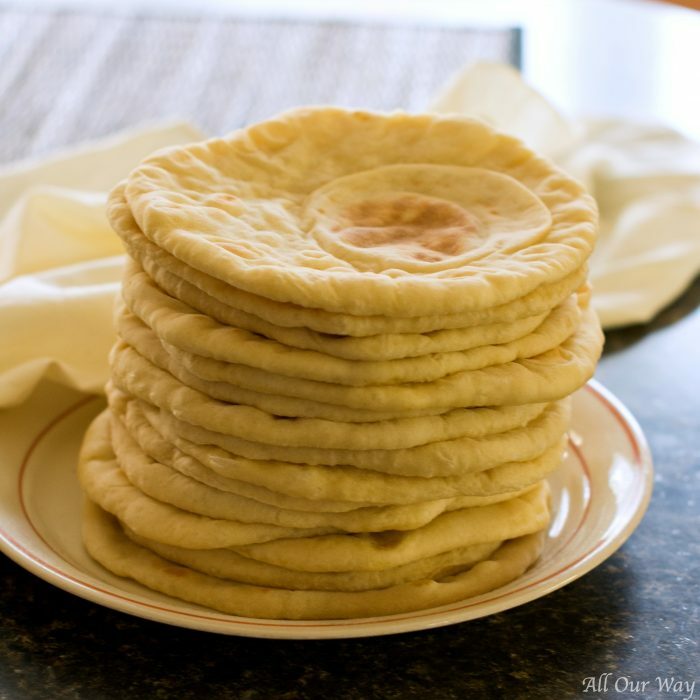 Is your Indian flatbread made with yeast? I’ve seen some that aren’t. We made one before this “accidental” recipe and it was okay — not as chewy and pliable as this one. Thank you, Amy! Well, there are so many great recipes out there we love trying new dishes. You can never go wrong with homemade unless you read the recipe wrong. ? Even then you can sometimes make lemonade out of the lemon. I am a bread lover. I do make bread from scratch, but have never made flatbread. I buy it all the time, so this recipe is truly intriguing to me. Nothing beats the aroma of bread baking. I would use these for sandwiches, or slather peanut butter on and eat it for breakfast. Hi, Gloria! If you make bread this will come as a breeze! We are ready to make our 6th batch! 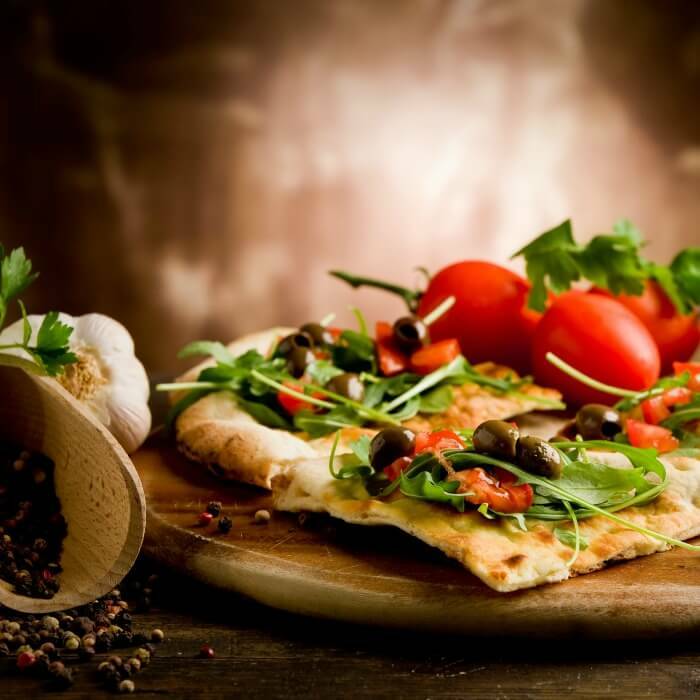 Your flat bread looks very beautiful :). the shapes are perfect. 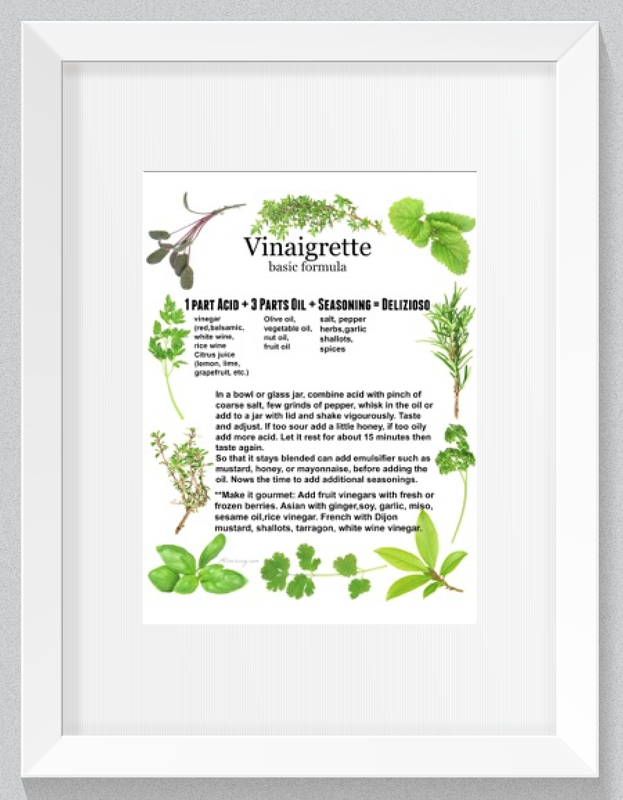 Can be used for many recipes, looking forward to make this soon. Thank you, Uma! They are really versatile, aren’t they? Now we’re getting requests for our baba ghanoush. I don’t think we can keep up with the grandsons! ? Marisa, great save! I love this! I hate food waste, so a save like this makes me happy. I make pitas (with pockets), but many times a pocket isn’t needed so this would be perfect. It looks soooo good. I’m a breadaholic, so I’m positively drooling right now! Hi, Jean! We make pitas also but the flatbread has a little different texture — more pliant. I think that’s what the family loves. I understand about being a bread lover, I’m one too. ? Those flat breads look out of this world and I love your pictures. They look so soft and tender. I am on look out for a recipe that freezes well and this might just be it. I can’t wait to try this soon. Hello, Sandhya! The flatbread freezes beautifully. I do wrap each one individually in plastic wrap and then put them in a freezer bag. This way individual ones can be taken out and warmed. Let me know how you like the recipe. Wow these turned out perfectly! I love flatbread but have never made it at home. Can’t wait to try this recipe! Hi, Marlynn! If you do try out the recipe let me know how you like it. Have a great weekend. wow love flatbread and even more homemade seems fairly easy I must venture in trying to make it soon. Mediterranean cuisine is one of my favorites. Hello, Adriana! You really should try making the flatbread — it’s very easy and I agree, Mediterranean has a lot of great dishes. You’re right, Marisa……flatbread is irresistible! Love it! Our grandsons are VERY PICKY eaters……but……this recipe could be a winner! Thanks, for another inspiration? Hi, Susie! Thank you for the sweet comment. You could put their favorite topping on the flatbread and see how that goes. Hope you have a wonderful weekend. Love and hugs! I love homemade breads. This one looks super easy and delicious. My family would really enjoy this recipe! Ciao, Chiara! 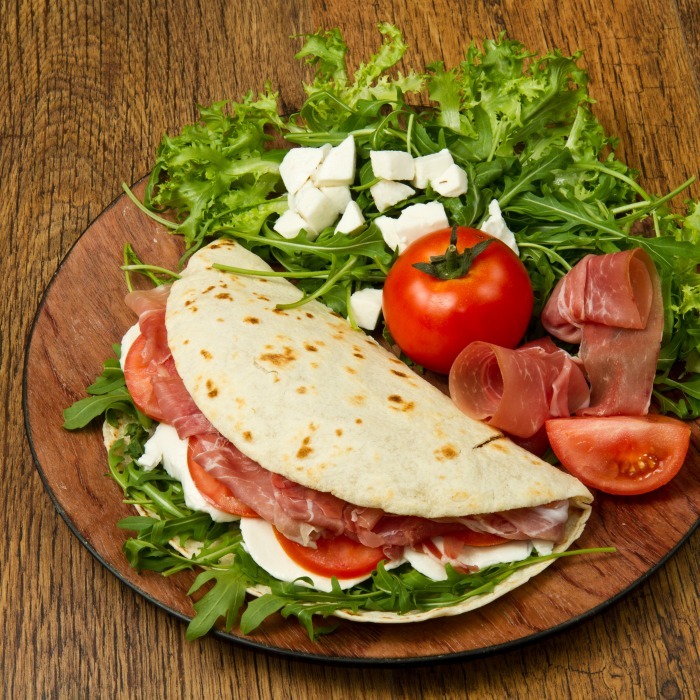 I would love to taste the piadina from Romagna. Do you have a recipe? We love making yeast bread. Un abbraccio forte. Hi, Stephanie! 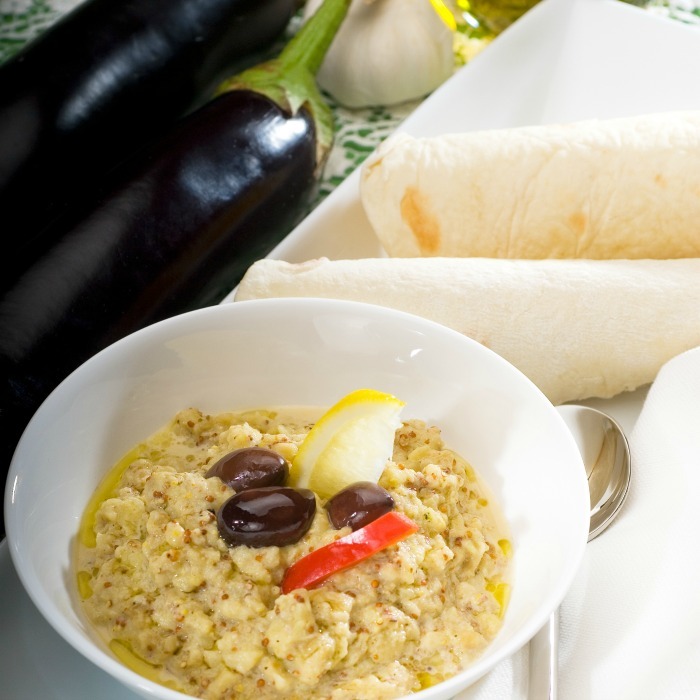 It’s amazing you said baba ghanoush because we are posting the recipe on Monday. OMG it is soooo good!! We had never tasted that dip before — we’re hooked. I love flat bread. 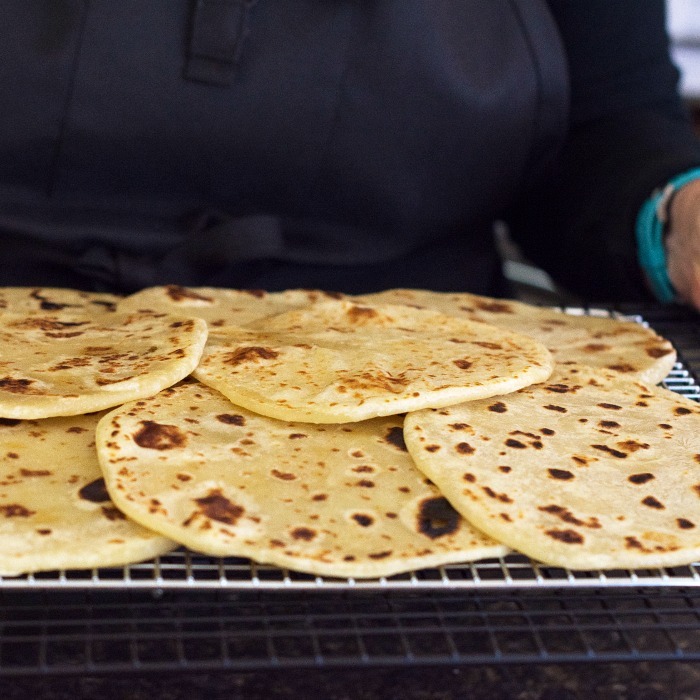 We make a lot of chapati and tortilla here. Love this Marisa. Looks so good and easy too. Can’t wait to try. Thank you Veena. Let me know how you like it! We just finished another batch today. ? This bread looks phenomenal, Marisa! Can’t wait to try it! I love bread….. Thank you, Diane! We are making some more today! We’re going to Indy tomorrow to see the grandsons play their sport’s games. Have a great weekend. Abbracci!! Ti abbracci anche tu, Marisa! Hi, Ginny!! Thank you so much for bringing it to my attention. I added it — it’s 1 Tablespoon extra-virgin olive oil. This goof got past two people — me and my editor-in-residence (Honey). We’ve made the recipe 5 times already and making another batch today to take up to my daughter and family. 🙂 If you have any questions please ask. Let me know how you like the recipe. I love flatbread. I love bread! Your flatbread looks beautiful. All so even and shaped perfectly. I am so glad you and “Honey” perfected the recipe. I can just copy it and make it. Looking forward to doing just that. I love all those Mediterranean ingredients you served with it. A feast. Hi, Jovina! Our weakness is bread, too. After a few recipe mishaps, we came to what we thought was good. If you make the recipe, save out a chunk for a pizza. It is terrific! !